20-year old Poornima belongs to a poor family. She has three members in the family. After completion of 12th standard, she discontinued her studies because of financial condition of the family. Her mother was the only earning member in the family who was getting only Rs.5000/- per month and taking care of her two children. Later her elder sister also started working but as she has not completed higher studies so she was not getting a good salary and her income was not sufficient for leading a quality life. During mobilization, mobelizers came to know about her family. They went to her house and informed her about the free three months skill training program provided by Don Bosco Tech (Trombay). They encouraged her to enroll in the training program. But her mother was not willing to send her daughter out of the house. Mobelizers insists her mother to visit centre once before reaching on any conclusion. She agreed to visit centre. When she saw that many girls are already getting training in the centre, she was convinced to join the training program. Trainers described her deliverables of the program and also said, “Don Bosco Tech will assist you to find a placement after successfully completion of the training.” After seeing everything she enrolled in Assistant Beauty Therapist domain.While the training Poorinima was very attentive, or regular trainee and completed her assessment with good marks. After training, Don Bosco Tech assisted her to attend the interview for placement. 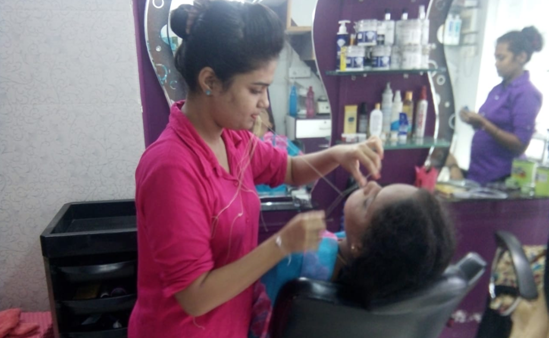 Now she is working in a nearby Parlor and getting Rs. 6000/- per month and become self independent. Now she is helping her family financially. She is also planning to open her own parlor. She is thankful to Don Bosco Tech who has given a new ray of hope so that she could be able to break stereotype laws of the society in which some girls are not allowed to go out and do what they want to do.